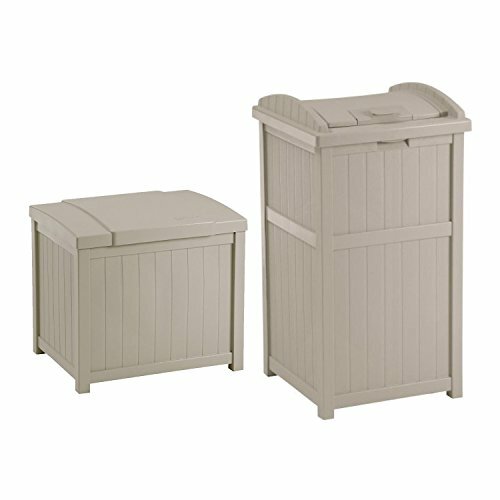 Your yard, garden, and pool supplies deserve to be stored away in style in the Suncast 22-Gallon Resin Deck Box, Light Taupe w/ 30-33 Gallon Trash Can Hideaway package. These light taupe deck boxes holds your indoor or outdoor goodies perfectly and looks good doing it. It is constructed of durable resin and features a stay-dry design. The stay-dry design sticks to its words and surely won't leave you with damp supplies no matter what the weather decides to do. Also included in this package is the Suncast Trash Can Hideaway that conceals your unsightly trash can from your everyday view. This stylish container features an attractive wainscoting design and taupe color to match any decor. It can hold standard 30-33 gallon garbage bags for those big loads. Made out of strong resin material, the trash can withstand the wind and rain. No tools are required for assembly and it can be put together in just 5 minutes.